In addition to our mudjacking services, KC Mudjacking & Concrete Repair also offers exceptional polyjacking you can depend on! Polyjacking is an extremely efficient method for several different types of applications, including airport runways, roads, curbs, heavy machinery stabilization, and more. The first step of the polyjacking process is to drill a small hole through the concrete and into the subgrade. Then, a tapered delivery port is placed into that hole to inject our polyurethane material underneath the slab. With incremental injections, the concrete will slowly begin raising – the foam fully expands within 10 to 15 seconds, which allows us to properly monitor the raising of your concrete and prevent any chances of over raising. Polyjacking fills any voids, stabilizes the soil underneath, and efficiently raises concrete to suit your needs. Unlike mudjacking, polyjacking requires much smaller and fewer drilled holes to inject the polyurethane material that raises the concrete. The holes measure to be around 5/8” and provide plenty of space for the foam to fill in any empty space underneath the slab. It effectively expands within seconds, making polyjacking a quick and simple solution to restoring the use of your concrete! The polyurethane material we use always stays intact as well, which provides an affordable solution that also adds to the longevity of any surface. 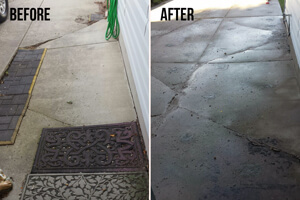 If you would like to learn more about our services and schedule a consultation with one of our specialists, be sure to contact us at KC Mudjacking & Concrete Repair today!